A common mistake many pool owners make is not properly preparing their swimming pool for the winter. 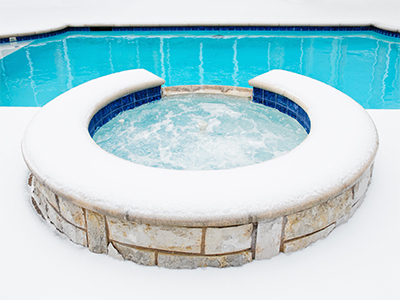 Freezing can cause serious damage to your pool so it is important that you take the proper precautions to at the very least minimize this damage. Katchakid pool covers make your life a lot easier when it comes to this task with its simplicity and design. Step 1: No matter what products you are using, it is essential to follow the directions on the bottle! Step 2: Always use the proper equipment when handling dangerous cleaning products. People often get hurt when these chemicals come in contact with their skin or clothing. Step 3: After getting the proper equipment it is also important not to breathe in the chemicals. Step 4: Never add water to your chemicals!! Some chemicals are highly reactive and can cause serious harm. A great way to avoid using all these harmful chemicals is too simply take care of your pool in the first place. One of the best ways to keep a clean pool is to purchase the proper pool cover. The Katchaleaf Pool Cover is a fine mesh, custom-shaped pool leaf that will ensure a clean, healthy pool! The chemistry level depends on your environment and the current condition of your pool. Some say this is the most tedious task of owning a pool. Cleaning out all the junk that nature throws at you is very frustrating. Katchakid’s pool leaf covers are made from a blend of lightweight, UV stabilized knitted polyethylene mesh, the Katchaleaf pool cover allows rainwater to drain through the cover while it keeps debris such as leaves, twigs, pine needles, and bugs out and can survive in a harsh environment. This is pretty straight forward so no explanation is needed. Finding the right pool cover for this can be very frustrating, a common problem is when puddles accumulate on the surface of your cover. An Awesome feature of Katchaleaf is that puddles cannot accumulate on the surface, so you won’t end up with a slimy, decomposing mess to attract mosquitoes. Just vacuum the silt and Katchaleaf will be ready for a new season. Follow these guidelines and you will have an awesome, stress free winter!